Owing to the global rise in the number of multi-resistant bacteria species, development of highly efficient antimicrobial agents less prone to induce resistance in microbes has garnered growing interest. Antimicrobial peptides (AMPs), also sometimes referred to as host-defense peptides, often showcase broad and effective antimicrobial activity, acting as a part of the innate immune system. Dermcidin is one of the major antimicrobial peptides detected on human skin [6, 11]. Dermcidin and its derivatives have been shown to exhibit broad scale antimicrobial activity against a number of pathogens, including M. tuberculosis  and S. aureus . DCD-1L is a 48 amino acid peptide originating from the proteolytically processed 110 amino acid precursor peptide. DCD-1L has been shown to exhibit broad scale antimicrobial activity against a range of pathogens, including E. coli, E. faecalis and S. aureus. Like other dermcidin derivatives, the peptide has an overall negative net charge at physiological pH, contrary to the commonly expected positive charge of AMPs [8, 10]. There has been controversial debate regarding the exact mechanism of action of dermcidin and its derivative peptides, including DCD-1L [15, 4, 14, 10]. However, generally the presence of α-helical structures has been attributed as a marker for antimicrobial activity, as is common for a wide variety of AMPs . The experimental data regarding the three dimensional structure of dermcidin has thus far been mostly limited to circular dichroism (CD) spectroscopy studies, most often carried out in solvents that promote stabilization of protein secondary structure, such as TFE, as well as other membrane mimicking environments. [11, 10, 7] However, dermcidin appears as active in its native environment of sweat, which is a naturally acidic, mostly aqueous environment with a pH of 4.0 - 6.8 and also contains low concentrations of monovalent and divalent ions, including sodium (20 - 60 mM), chloride (20 - 80 mM), potassium (10 mM) and magnesium (1 mM). The few conformational studies of dermcidin in environments effectively mimicking its natural habitat, commonly report a random coil secondary structure with no α-helicity [14, 10]. Despite the apparent lack of conformational studies of dermcidin derivatives in low salt aqueous environments, the antimicrobial activity of dermcidin has been widely mapped in such conditions [11, 14, 10, 4]. According to prior studies, the antimicrobial activity of dermcidin appears independent of pH level and salt concentration . Additionally, studies have underlined the importance of AMP interaction with monovalent and divalent ions, such as those found in human sweat, in regards to induced antimicrobial activity [15, 3, 5]. Although all molecular systems can be theoretically described accurately through quantum mechanics, ab initio based methods remain inaccessible for description of complex, large system due to their high computational expense. Alternatively, a molecular system can be described using classical mechanics as parametrized by a force field. A force field is a collection of energy functions and their associated parameters for describing the intra-molecular and inter-molecular interactions in a molecular system. Prior computational studies of dermcidin have concentrated on exploring the mechanism of action of the peptide, with emphasis on peptide behavior in environments mimicking the bacterial cell membrane, which the peptide is assumed to interact with [15, 7, 1]. Both experimentally and computationally, dermcidin has been found to assume a helical conformation in membrane conditions [10, 15, 7]. On the molecular dynamics front, special interest has been directed towards the behavior of a dermcidin tetramer in a bacteria mimicking phospholipid membrane [15, 7]. Here, we simulate a DCD-1L peptide surrounded by water, both in the presence of counter ions (due to the peptide's intrinsic net charge) and with added salt, using molecular dynamics simulations. The simulations were carried out using the GROMOS force field parameter set 53A6 . Based on the computed molecular dynamics trajectories, we probe the evolution of secondary structure of DCD-1L and its other physical properties in different salt concentration and temperature environments. This examination of DCD-1L stability and activity in low salt aqueous environments provides crucial information for further development of our hydrogel based product, a major component of which is an additive containing water phase into which the dermcidin fusion peptide is incorporated. Your browser does not support HTML5 or support the media format. We recommend that you try a different browser or update your current browser. Figure 1. Movie render of the first few nano seconds of one of our simulation trajectories. 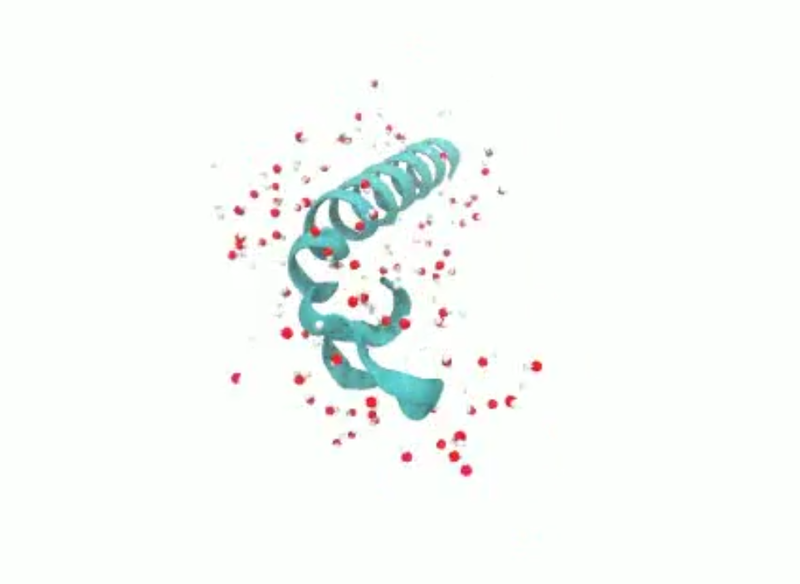 Molecular dynamics allows us to observe evolution of molecular properties over time, such as peptide secondary structure, shape and hydrogen bonding. Becucci, L., Valensin, D., Innocenti, M., & Guidelli, R. (2014, Jan). Dermcidin, an anionic antimicrobial peptide: influence of lipid charge, pH and Zn2+ on its interaction with a biomimetic membrane. Soft Matter, 10(4), 616–626. Brogden, K. A. (2005, Mar). Antimicrobial peptides: pore formers or metabolic inhibitors in bacteria? Nat. Rev. Microbiol., 3(3), 238–250. Brogden, K. A., De Lucca, A. J., Bland, J., & Elliott, S. (1996, Jan). Isolation of an ovine pulmonary surfactant-associated anionic peptide bactericidal for Pasteurella haemolytica. Proc. Natl. Acad. Sci. U.S.A., 93(1), 412–416. Eissa, A., Amodeo, V., Smith, C. R., & Diamandis, E. P. (2011, Jan). Kallikrein-related peptidase-8 (KLK8) is an active serine protease in human epidermis and sweat and is involved in a skin barrier proteolytic cascade. J. Biol. Chem., 286(1), 687–706. Flad, T., Bogumil, R., Tolson, J., Schittek, B., Garbe, C., Deeg, M., . . . Kalbacher, H. (2002, Dec). Detection of dermcidin-derived peptides in sweat by ProteinChip technology. J. Immunol. Methods, 270(1), 53–62. Jung, H. H., Yang, S. T., Sim, J. Y., Lee, S., Lee, J. Y., Kim, H. H., . . . Kim, J. I. (2010, May). Analysis of the solution structure of the human antibiotic peptide dermcidin and its interaction with phospholipid vesicles. BMB Rep, 43(5), 362–368. Nguyen, L. T., Haney, E. F., & Vogel, H. J. (2011, Sep). The expanding scope of antimicrobial peptide structures and their modes of action. Trends Biotechnol., 29(9), 464–472. Oostenbrink, C., Villa, A., Mark, A. E., & van Gunsteren, W. F. (2004, Oct). A biomolecular force field based on the free enthalpy of hydration and solvation: the GROMOS force-field parameter sets 53A5 and 53A6. J Comput Chem, 25(13), 1656–1676. Paulmann, M., Arnold, T., Linke, D., Ozdirekcan, S., Kopp, A., Gutsmann, T., . . . Schittek, B. (2012, Mar). Structure-activity analysis of the dermcidin-derived peptide DCD-1L, an anionic antimicrobial peptide present in human sweat. J. Biol. Chem., 287(11), 8434–8443. Schittek, B., Hipfel, R., Sauer, B., Bauer, J., Kalbacher, H., Stevanovic, S., . . . Garbe, C. (2001, Dec). Dermcidin: a novel human antibiotic peptide secreted by sweat glands. Nat. Immunol., 2(12), 1133–1137. Schlick, T. (2010). Molecular modeling and simulation: an interdisciplinary guide: an interdisciplinary guide (Vol. 21). Springer Science & Business Media. Schlick, T., Collepardo-Guevara, R., Halvorsen, L. A., Jung, S., & Xiao, X. (2011, May). Biomolecularmodeling and simulation: a field coming of age. Q. Rev. Biophys., 44(2), 191–228. Senyurek, I., Paulmann, M., Sinnberg, T., Kalbacher, H., Deeg, M., Gutsmann, T., . . . Schittek, B. (2009, Jun). Dermcidin-derived peptides show a different mode of action than the cathelicidin LL-37 against Staphylococcus aureus. Antimicrob. Agents Chemother., 53(6), 2499–2509. Song, C., Weichbrodt, C., Salnikov, E. S., Dynowski, M., Forsberg, B. O., Bechinger, B., . . . Zeth, K. (2013, Mar). Crystal structure and functional mechanism of a human antimicrobial membrane channel. Proc. Natl. Acad. Sci. U.S.A., 110(12), 4586–4591. van Gunsteren, W. F., Bakowies, D., Baron, R., Chandrasekhar, I., Christen, M., Daura, X., . . . Yu, H. B. (2006, Jun). Biomolecular modeling: Goals, problems, perspectives. Angew. Chem. Int. Ed. Engl., 45(25), 4064–4092.